I placed an order for a few new polishes that I just fell in love. 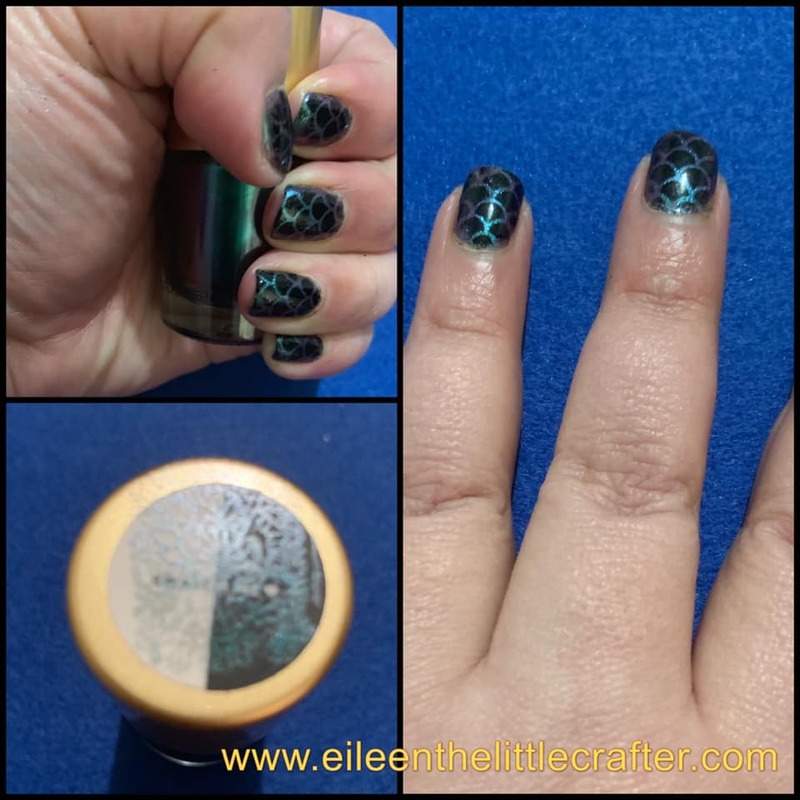 I mainly really wanted to stamp and see how the shade named 9ml Green Duochrome Nail Stamping Polish Chameleon Lacquer Nail Art Plate Printing 001 from beauty big bang. I can say that as a nail base color, applies well, and has fantastic color pay off. Stamping so far I have to do some testing because I did a swap sticker to the bottles and the doesn't seem to show so well. So the bottles on stamping polish came, and I was so excited. The colors both looking beautiful in the bottles. Since I had some swap stickers that I bought from Maniology to, place them on the and stamped out the with a lace image. The swap me stickers are black and white. This is supposed to help with you see how a stamping polish will look on a light or dark color nail. I think this is a great idea wished more companies would add them. I used a base coat on my nails. I think that I could have just painted my nails with one coat, but I had a few that I wanted to fix. After a few minutes, I then applied a speedy coat and thought I was done. I was wrong, started thinking about summer vibes when I looked over and seen my mermaid scaled stencils from whats up nails. I started to look at the rest of my collection on stamping polish. Really for this step, any nail polish would do, just work quickly with regular polishes since the dry quicker. I went with black finish from Maniology. I added the stencil to the nail, painted on the black to a makeup sponge then added that to my nails. I love using a makeup sponge since it is more comfortable in my opinion to control. I used if I was working on a mix media or crafting project. Once I was done added some smudge free coat, let it dry and add a glossy top to finish the look. 1) You want to place the stencil on really well, you use it whole or cut to fit to size. 2) Use a little bit of nail polish, build up the color. I find a sponge helps with that and if you get too much on the sponge, then just dap some of it off. 3) You can use one stencil for your whole hand start with the pinky and so on but use another stencil for the other because of the polish will start to build up and stick of the stencil will lose it hold. I hope that you have enjoyed today's blog post, please don't forget to subscribe. If you have any comment, questions, please leave them down below, or you can email me. My email address is Eileen@eileenthelittlecrafter.com. Thank you for stopping by the blog today bye for now Eileen.